The Reserve Bank of India (RBI) has forecast a healthy growth for the country’s economy at around 6.5 to 7 per cent. The domestic industry today welcomed the slack season credit policy announced by the Reserve Bank of India (RBI) and said that the economic outlook for 2004-05 is very much in line with the expectations. In video: Financial markets bounce back after black Monday. 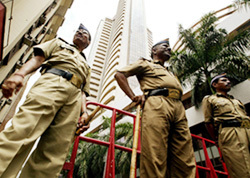 Market regulator Securities and Exchange Board of India (SEBI) today said the risk management systems at the stock exchanges are robust to withstand extreme volatility in the market and there will not be any problem in settlement of trades. In the first major investment coinciding with the process of formation of the new Congress-led Government, India’s biggest carmaker Maruti Udyog (MUL) today announced setting up of a diesel engine plant with an investment of Rs 350 crore. 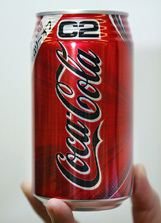 Coca-Cola Japan launches "Coca-Cola C2", a new low-carbohydrate cola, in Tokyo on Tuesday. The launch marked the worldwide debut of the beverage. North America will get its first taste later this summer. The United States Agency for International Development (USAID) has granted a project worth Rs 17 million to Punjab Agricultural University to give a boost to the food processing industry in the state. Indian Airlines on Sunday achieved another milestone in its operations this year when it transported over 27,900 passengers around the country beating its previous best achieved just about a fortnight ago. Amid demands by private cellular operators that they be allowed to share BSNL’s network on commercial terms to provide service to rural and remote areas, BSNL has sought a ‘quid pro quo’ arrangement saying it too should be permitted to take advantage of the wireless network of private players. HAL to export ALH to USA and Israel. Interest rates stable at 6 pc. Indian companies and partnership firms allowed to invest up to 100 per cent of their net worth overseas. Banks allowed to raise long-term bonds to finance infrastructure. Report of the working group on financial conglomerates is being put in public domain. Fresh licences to urban commercial banks only after a comprehensive policy. Waiver of service charges on banks for electronic funds transfer and electronic clearing services. Board for Payment and Settlement Systems set up. A Working Group on Electronic Funds Transfer for Capital Market constituted. Presenting the RBI’s annual policy for 2004-05, RBI Governor Y.V. Reddy said in Mumbai that India’s economy is likely to grow at 6.5 to 7 per cent provided there are no unforeseen circumstances. “India would continue to be among the top performers globally in terms of growth in gross domestic product (GDP) in the current fiscal,” Mr Reddy said. According to Mr Reddy, the RBI expects the inflation rate to stabilise at around 5 per cent during the current fiscal. The inflation rate in the last financial year was around 5.5 per cent. Interests rate remained unchanged at 6 per cent. The RBI has, however, come up with a red flag over rising oil prices that may impact the Indian economy. Mr Reddy noted the Indian economy was, however, resilient enough to withstand such shocks due to a buffer food grain stock and comfortable foreign exchange reserves. Mr Reddy observed that a major issue that has now arisen relates to geopolitical uncertainties and the macro-economic imbalances in the US and their possible consequences on the rest of the world. Drawing the attention of bankers to the impact of interest rate uncertainties, the volatility among major currencies and their impact on the financial sector, Mr Reddy said these issues would remain a major concern for the emerging economies. He said the most distinguishing feature of the external sector during 2003-04 related to the large capital flows with its inevitable implications for the conduct of domestic monetary policy and exchange rate management. The Governor said there was a need to overcome the bottlenecks in flow of bank credit to agriculture and small and medium enterprises. A step-up in investment activity in infrastructure would augment credit off-take for productive sectors. Mr Reddy informed the RBI has also reduced the minimum cash margin within the overall margin to 25 per cent from the current 20 per cent. The decision was taken on the recommendation by the task force constituted for monitoring the developments in the financial markets, an RBI statement said. The margins against shares were increased from the level of 40 per cent to 50 per cent in January 2004, the statement added. The RBI has also introduced a gold card scheme for creditworthy exporters with good track record for easy grant of loans on best possible terms. Under this scheme all creditworthy exporters, including those in small and medium sectors with good track record, would be eligible for the scheme from banks. The specific benefits being offered by the banks would be clearly spelt out. Banks would process requests from cardholders within a prescribed time frame. In-principle limits would be set for a period of three years with a provision for stand-by limit of 20 percent to meet urgent credit needs. Cardholders would be given preference in the matter of granting of packing credit in foreign currency. While GDP growth is expected to continue to be robust, there could be some concerns on inflation due to rising oil prices as well as excessive domestic liquidity, the Confederation of Indian Industry (CII) said. The policy focuses on credit delivery in three key areas of agriculture, small and medium enterprises and infrastructure, CII said. “In the infrastructure sector, the RBI policy has taken some important steps including the widening the definition of infrastructure lending to include projects such as construction of agriculture related units, educational institutions and hospitals. Banks have been allowed to raise long-term bonds for infrastructure financing”, the CII said. The Federation of Indian Chambers of Commerce and Industry (FICCI) has welcomed the RBI’s decision to expand the definition of infrastructure lending to include exposures to farm sector, agro-processing units, educational institutions and hospitals. “This, combined with several measures to improve the flow of funds to the agriculture sector, will give a big push to growth of agriculture sector in the country,” FICCI president Y.K. Modi said in a statement. The Associated Chambers of Commerce and Industry (Assocham) welcomed the RBI ‘s focus on policy changes. “We hope the message of consolidation and stability in the monetary management would reassure the market and prevent players from reacting adversely,” Assocham president Mahendra K. Sanghi said. The reduction in the benchmark PLR by about 50 200-basis points is indeed a step in the right direction. The initiative should be strengthened so that the BPLR falls further. The FICCI President also welcomed the expansion of definition of infrastructure lending wherein the emphasis is largely on the infrastructure to agro-processing and agriculture and as also on educational institutions and hospitals. President of PHDCCI Mr Ravi Wig welcomed the measures announced by the RBI. He said that availability of suitable loan facility for storage, securitisation of agriculture loans as priority sector lending, waiving margin requirements for agriculture loans will indeed give a boost to agriculture and related industry. “The systems have witnessed volatility but they are robust enough to withstand extreme situations,” SEBI chairman G N Bajpai told PTI here after a review meeting with senior regulatory officials and exchange representatives. Mr Bajpai, who cut short his visit abroad to return to the city early today in the wake of the market crash, said the market regulator is keeping a close watch on the developments and would take stern action against those involved in market abuse. The long-awaited major investment will be for production of diesel engines with the technology from Italy’s Fiat Auto and US-based General Motors’ subsidiary, Adam Opel. “Our decision to invest in a new facility to manufacture diesel engines underlines our parent, Suzuki Motor Corporation’s, continued commitment to India,” Maruti Managing Director Jagdish Khattar said in a statement after the meeting of the Board today. “It is in keeping with Maruti’s strategy of providing suitable products for diverse segments of customers. “We are confident that by setting up an advanced facility to manufacture state-of-the-art diesel engines, we will be able to meet this demand of customers as well,” he said. The new diesel engine facility would have a capacity to manufacture one-lakh units annually. The production of the 1.3 litre diesel engine on the Common Rail Direct injection (CRDi) system will begin from 2006. The measure has been taken to meet the growing demand for diesel engine cars in the Indian market, Mr Khattar said. Meanwhile, the company reported more than three-fold increase in the net profit at Rs 542.18 crore during 2003-04. The total income grew by 31 per cent at Rs 9,751 crore during last fiscal, a company statement said here after a board meeting. During the fourth quarter ended March 31, 2004, the net profit surged 193 per cent at Rs 157.1 crore while the total income jumped 33 per cent at Rs 2,987 crore during January-March 2004. The project will be operated in collaboration with Ohio State University of the USA for three years. Dr K.S. Aulakh, Vice-Chancellor, PAU, told TNS here today that it planned to set up a food industry centre at the PAU to develop and popularise product of new food products among the agro processing units. In addition to production of food products, it would expand the food industry to generate additional employment in the rural areas. Dr Aulakh said a two-member team of Ohio State University was in Ludhiana for one week to discuss the project strategy. Dr G.S. Chahal, Additional Director, Research (agriculture), had been appointed as co-director of the project. The performance of the Indian Airlines, which has been facing the axe of disinvestment, is all the more creditable as the figure has been achieved not in the peak season. On Sunday, Indian Airlines ferried a total of 27,956 passengers. Post September 11 incidents, this is the highest number achieved by the airlines. On April 30 last, the airlines had ferried 27,350 passengers. The figure achieved is significant in more than one ways for the Indian Airlines. It not only reflects the airlines, which had severely gone into the red was clawing its way back into profits, but was again back in favour with the domestic travellers despite all the hype being created by the private airlines about the services they were putting on offer for travellers with them. “Their infrastructure should also be shared by BSNL. We should also be allowed what they are asking for,” BSNL chairman and managing director V.P. Sinha told PTI here. Mr Sinha’s comments come in the wake of demands by private cellular firms that they be allowed to share the infrastructure of BSNL to serve rural and remote customers. Acknowledging the need to increase the slowing mobile subscriber additions in the country, TRAI had said it was considering measures to accelerate the subscriber growth outside metro cities. Leading mobile phone equipment provider, Motorola, today said it is successfully using BPL India’s multi-vendor wireless network, enhancing end-user experience for the operator’s 1.2 million subscribers. BPL Mobile had utilised Motorola’s wireless infrastructure Multi-Vendor GSM RAN Optimisation Service to analyse and improve the end-to-end performance of its network.